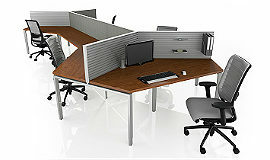 BOLD Office Solutions represents the current move in systems and benching to open and collaborative office environments. 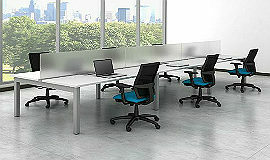 These settings encourage innovation and the free exchange of ideas while still allowing room for individual work areas. 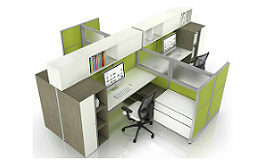 We also offer an extensive selection of more traditional modular panel systems to create more private work spaces. Our space planning experts will assist you through the decision making process ensuring the correct product, configuration, and finish options needed to create idea sharing and problem solving without sacrificing the need for individual focus work. Collaboration, creativity, and innovation are key elements in setting your business apart from the competition. If you are looking to add onto additional panels in your office, we also offer multiple lines of pre-owned and refurbished systems from several major manufacturers. Available in many options, our traditional and open plan solutions produce a functional and creative business environment. 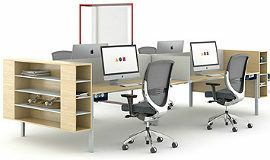 Kimball Office – KORE KORE is designed for working and living—complete with elements for privacy, media integration, and solutions for learning and training. Kimball Office – Xsede Combines the openness of a bench with the visual privacy of a panel system to balance focus and collaboration. 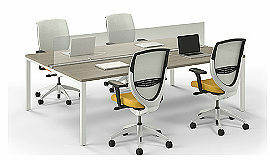 Kimball Office – Priority Versatile components that fit together to create modern work environments with timeless appeal. Kimball Office – Xsite This frame and tile system create an environment where both independence and interaction are supported. 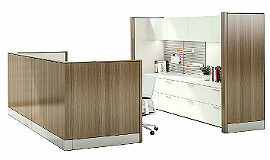 Kimball Office – Cetra Super solid monoshell panel construction makes this system functional for years to come. Lacasse – Nvision Allow your employees to work well individually and together with materials that allow for total flexibility. Watson – Tonic Super simple benching features benches, storage, and tables with a simple and clean design. AIS – Oxygen Brings both form and function to the workplace in a package that is as high-tech and multi-functional as it is stylish. 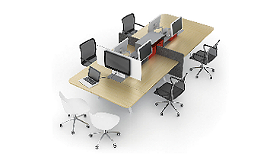 AMQ – ICON This line of products can be used for everything from private offices to benching applications. *This is only a partial list of the systems and benching we offer. 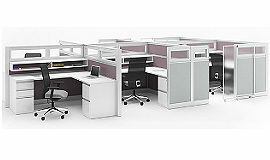 Give us a call at 402.934.6644 to find the right solution for your office.